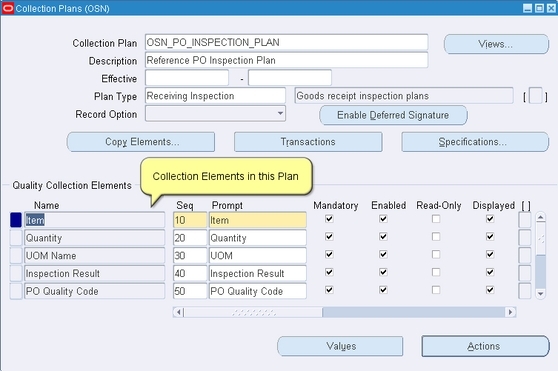 A Collection Plan (also refereed to as a quality collection plan or simply a collection plan) brings together the Collection Elements and a Specification and ties them to create the data object that drives quality inspections. There are many types of quality plans. These are listed in detail in the Quality User Guide. The data structure remains the same for all the different quality plan types available in Oracle Quality. Here, we shall see one of the most widely used quality plans being created – the Receiving Inspection Plan. Oracle Quality comes with a number of seeded collection plan templates that can be used to create user-defined collection plans. Dave decides to use these templates so as not to have to create plans from scratch. Also, these collection plan elements must be defined as Displayed, Mandatory and Enabled. Dave knows that copying from a template ensures that all of these points are complied with while creating a plan from scratch carries the risk of something getting overlooked. Hence the templates approach. 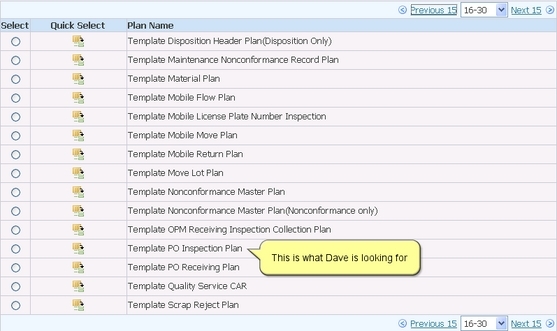 Dave intends to use the Copy Collection Plans feature in Oracle Quality to create a user-defined plan that would serve as the master copy. 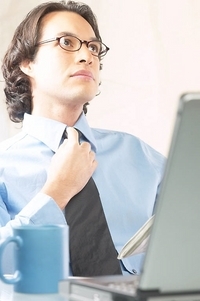 He seeks out the template for the Purchasing Inspection plan and finds it. Now, quality plans are organization-specific. So, Dave has to specify which organization the template should be copied to. This will be OSN – Office Smart Naperville, the organization Dave’s team had defined earlier here. This is shown below. Having determined the destination organization, Dave has to decide the name of the quality plan that would be created as a copy of the template. Dave chooses to follow a naming convention that has served him well in past implementations. The plan that is an immediate copy of the template will have underscores (_) in its name. This will differentiate it from other quality plans that will be derived from this one. Dave names his plan as OSN_PO_INSPECTION_PLAN as shown above. The prefix denotes the inventory organization to which the plan belongs. Dave queries for OSN_PO_INSPECTION_PLAN in the Collection Plans form to verify that it was indeed created. He finds it is there! Dave looks at the collection elements in the plan that came with the seeded template. He feels he needs to add more collection elements keeping in mind the Receiving Inspection process. These are a few of the collection elements that come pre-defined with Oracle Quality. Here’s what Dave is thinking. Dave knows that OSS would need a separate collection plan for each item in the OSN org. He therefore plans to make OSN_PO_INSPECTION_PLAN the Reference Plan or a Master Copy which would then be copied into individual item-specific plans. However, some of the most important tasks that help define a collection plan are yet to be done. The individual collection plans will need to be assigned to the correct transaction. Triggers will need to be defined, Action Rules associated with specific collection elements and Specifications assigned to collection plans. That is what Dave sets out to do in the next section.